This hummus happened by accident. I was browsing through Trader Joe’s, as one does, trying to look for snacks that are better for me than Doritos. I was also feeling lazy, so I picked up a tub of plain hummus, despite the fact that I’ve never found a store-bought tub that compares to my homemade version. I brought the stuff home, scooped it up with some crackers, and…boring (how shocking), some bell peppers: still boring. It needed acid and punch – so I decided to add some lemon and garlic. But I was out of lemons. My pickle jar stared at me suggestively, so I tried dunking a tart spear in the hummus, expecting the sesame and dill to probably hate each other, but they didn’t. The plain hummus got scraped into the food processor with a clove of garlic and a splash of pickle juice, and it was really freaking good. I ate a lot of it and didn’t want Doritos at all. 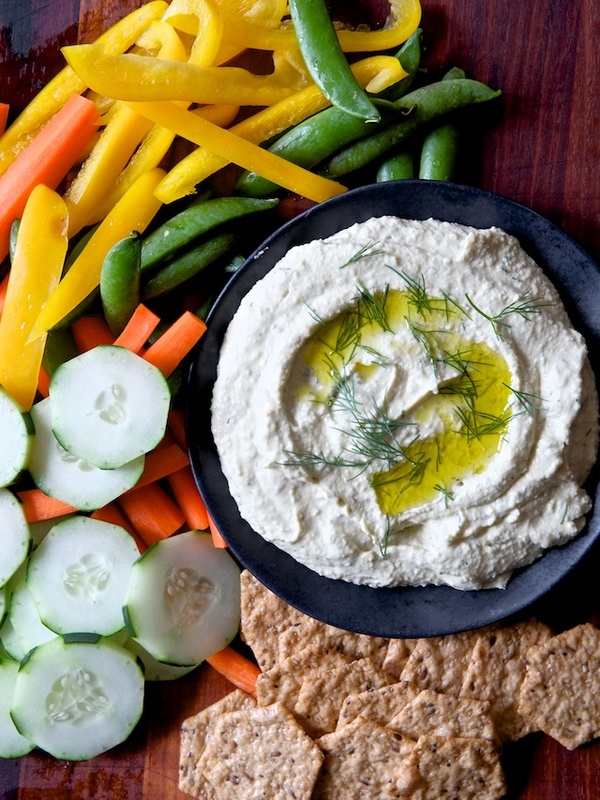 So, I decided to tweak and polish my homemade hummus recipe into a dill-pickle variation, and I’ve been snacking happily ever after. The end. 1. 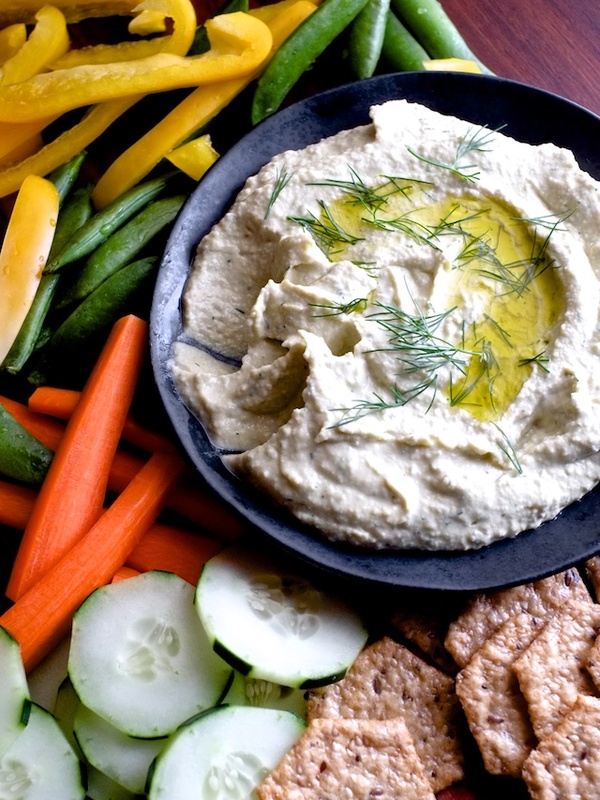 In a food processor, combine tahini with lemon juice, garlic, and 1/4 cup of the pickle juice. Pulse everything together until the garlic is incorporated and the tahini is lightened in color and thickened (check out my smooth and fluffy hummus recipe for a photo of the texture you’re looking for). Scrape the sides and bottom of the food processor and pulse again until all of the tahini is smooth and homogenous. 2. Add about 1/3 of the garbanzo beans, all of the chopped pickles, and another tablespoon of pickle juice. Turn the food processor on and let it run until the garbanzo beans are fully blended and smooth. 3. Continue to add pickle juice (a tablespoon at a time) with garbanzo beans in two more batches, blending until smooth after each addition (about 30 seconds). 4. Add dill and pulse until the dill is well-incorporated. Taste the hummus and add salt. From here you can adjust the flavor and texture further with more pickle juice or salt. If you want a slightly looser/lighter texture but are happy with the level of pickle flavor, blend in a tablespoon or two of water. The hummus will thicken as it sits in the fridge, so if you intend to keep it for a few days I’d recommend making it quite a bit looser than your average store-bought version. 5. Serve with crackers, cucumbers, carrots, celery, or bell peppers. A splash of olive oil on top looks pretty but isn’t really necessary flavor-wise. Um...this is calling my name. I'm 35 weeks pregnant and totally fit the stereotype of craving pickles (but NOT with ice cream). This idea is GENIUS. Totally going in my belly asap. Thank you! Thanks Beth! I hope you love it! Thanks lady! Pickles and chickpeas for the win! Thanks Melinda! Pickled tomatoes sound amazing. Let me know if you end up trying them in hummus! Well, the best recipes happen by accident sometimes ;-) And this one is a winner! Thanks Suzy! Happy accidents are the best. I made this today, really tasty! Thanks for the recipe, will definitely make again. Didn't want to throw out my pickle juice so I tried this. It came out great! Thank you for this creative idea!